This artist is truly amazing! He calls his work "eye candy" but I call it brilliant. Nychos bases his work on structure and it is beauty to behold. 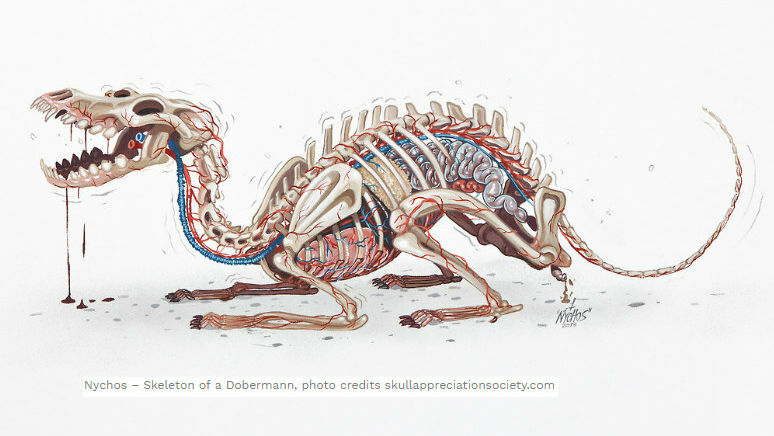 Every living being has an interior skeletal structure which determines shape and movement. No two are exactly the same. He adds a bit of fantasy to that, doing much work in a large wall format. That is extremely difficult, when you must have perspective. Lots of backing up to take a look! The work may be different from that which you appreciate as conventional, but it is astonishingly fantastic! There are more videos of Nychos' work on Widewalls. No, you won't see a dog in the video at the end of this. What you will see is a Thoroughbred by the name of Empire Maker. His record is impressive and his ability as a sire is escalating upward. He stands at Gainesway Farm in Kentucky for a current fee of $85,000. Dogs have long been assessed by equine standards, especially in earlier times. We have borrowed terminology and ideas about structure from horses, although there are enough differences in things such as bone length that vary even between breeds of dogs. One thing does remain the same. If the dog or horse is to be considered truly typey, then soundness should be the building block of type. Without being able to function as the history and purpose of the breed intended, a dog cannot be fully representative of that breed. Fashion comes and goes, but type within a breed, in the truest sense, remains the same. Now watch Empire Maker's perfect foot timing, flexibility of pastern, and overall balance. His is type personified. Enjoy! Bernese Mountain Dog Overlay of Bone, Body, Measurement, and Coat. So for now, send me your ideas on what you would like to see and I'll share my plan with you now. I hope to have an ongoing study of structure here and to feature smalls bits of information on the anatomy of the dog and the result of a particular structure to the function that it enables.